Dead or Alive is one of the most popular games from its creator NetEnt, and a quick YouTube search will reveal hundreds of videos of massive wins uploaded by its thousands of fans. In this review, we will explore why this game is considered a classic, and where its huge winning potential comes from. Dead or Alive was released back in 2009, but with its new HTML5 upgrade it feels as new and cool as ever. 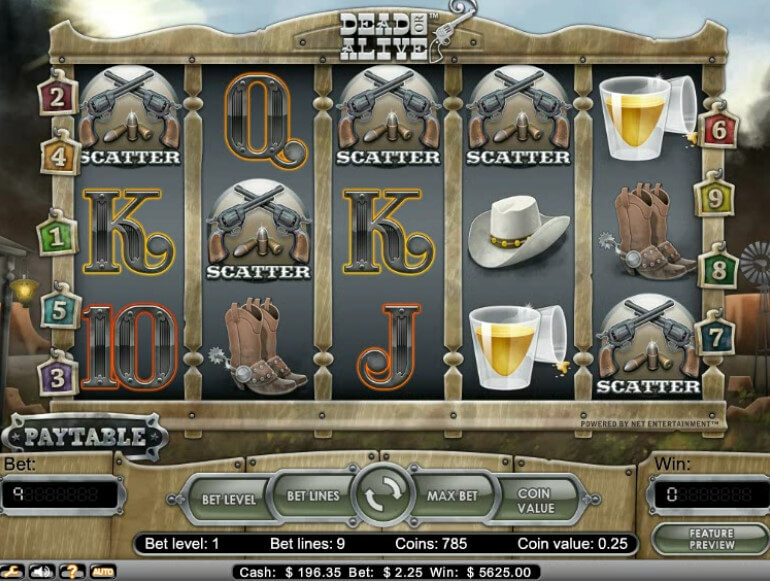 It has a western theme with bandits and cowboy gear, and on the surface it looks like a normal 5-reel, 9 paylines slot machine that you can find in any online casino games lobby. This video slot is nothing like normal due to its high volatility. A game with a high volatility will not pay out as often as low or medium volatile games, but in return it will pay out much bigger wins, and in Dead or Alive’s case it can pay you thousands of times your stake. The gameplay might seem a bit slow and boring to begin with, and this is a game that sometimes requires a bit of patience before you get to experience its action. Don’t give up on it though, once the big wins roll in you will be happy you stuck around for them, as it suddenly might multiply your bankroll many times with the press of a button. 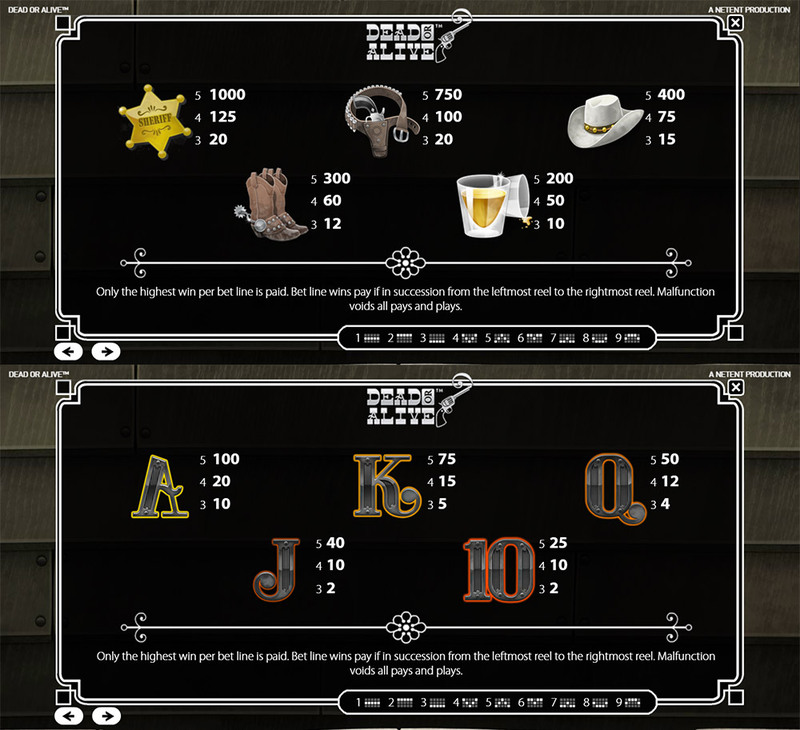 There are ten symbols in the game, with 10, J, Q, K and A being the lower paying symbols, and the sheriff star, gun belt and cowboy hat being among the highest. A full line of five high paying symbols will give you a good chunk of cash, and they drop in quite often. There is also a wild symbol which replaces any symbol in a payline, and a scatter symbol which activates the free spins mode. The free spins mode is what it’s all about in this game. To activate it, you need to hit three or more scatter symbols. Hitting more of them won’t give you more spins, but you will get a bigger instant cash prize – five of them will pay you 2500 times your bet stake. We weren’t kidding when we said that this game has some serious potential. What makes Dead or Alive legendary is its free spins feature. You start out with 12 spins, and all wins are multiplied by 2, making every win twice as big as in the base game. But every time you hit a wild symbol in the bonus, it is sticky and will remain on the reel for the rest of the free spins. The wilds are represented by the five legendary wild west villains Apache, Belle, Jesse, Della and Billy. If you hit a wild on all of the reels, you are rewarded with 5 extra free spins, and then you are almost guaranteed a massive win of several hundreds, if not thousands, times your bet stake. But it does not end there, and we have barely begun. If all the five wilds are in the same payline, you will have a full wild line for all the remaining spins. Each wild line pays 333 times your bet stake, and if you manage to get for example 10 free spins with a wild line, that is a monstrous 3333 times your bet. You can even get multiple wild lines, so that amount can even double or triple. Don’t get disheartened if you don’t hit the magical wild line on your first few bonuses though – hitting one can be rare, but never disappointing. Dead or Alive is a game for action seeking players who wants to go for nothing but the biggest wins. A true classic that can turn a bet of a few cents into thousands. It runs and feels great both on desktop and on mobile, and while it might feel slow at times, its awesome winning potential makes it so worth it. 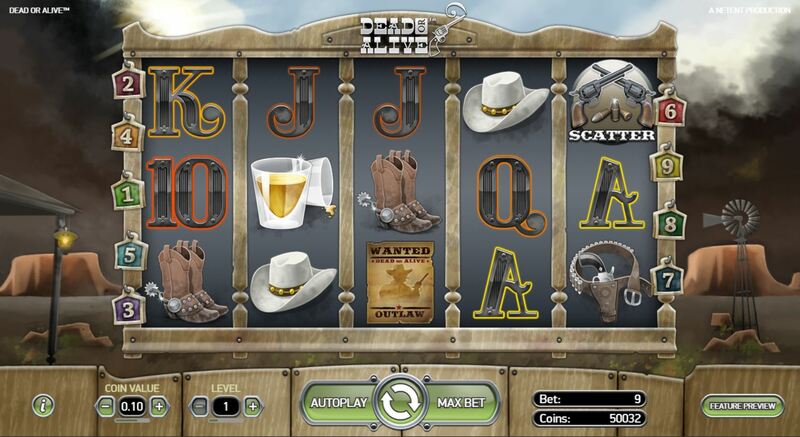 This is a game where you don’t have to bet much to feel the real thrill of hitting the big money, and as long as online casinos exist, Dead or Alive will always stand as a favorite among players.